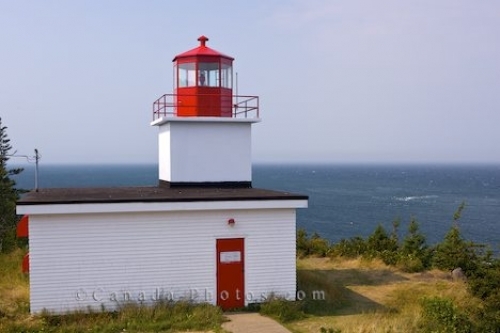 A unique square building with a beacon on top is home to the Long Eddy Point Lighthouse in Grand Manan in New Brunswick, Canada. The waters in the Bay of Fundy swirl below the Long Eddy Point Lighthouse, also known as The Whistle, which stands on the cliff in Grand Manan, New Brunswick in Canada. Dating back to 1874, this square lighthouse building required restorations in 1973 from daily wear and tear and the fierce winds which sweep across the area. When visiting the Long Eddy Point Lighthouse, scan the surface of the water for blows from whales which frequent these waters or other species of sea life. Long Eddy Point Lighthouse, aka The Whistle, North Head, Grand Manan Island, Grand Manan, Bay of Fundy, The Fundy Isles, Fundy Coastal Drive, Route 776, New Brunswick, Canada. Picture of the Long Eddy Point Lighthouse above the rough waters of the Bay in Fundy in Grand Manan, New Brunswick.